For my birthday, Beloved and I had dinner at The Seafood Club by Red Crab. If the obviousness doesn’t strike, this seafood restaurant specializes in crabs. More appropriately, they specialize in alimango, since Red Crab is self-titled “alimango house”. While the Tomas Morato branch is a place we often pass by, the particular branch we ate in is located at Greenbelt 3. Aside from crabs, their menu consists of other seafood and some meat items. However, since we were here, we didn’t bother with the meat. We ordered for ourselves their Crab Relleno Salad (295 Php) because it looked good in the picture. 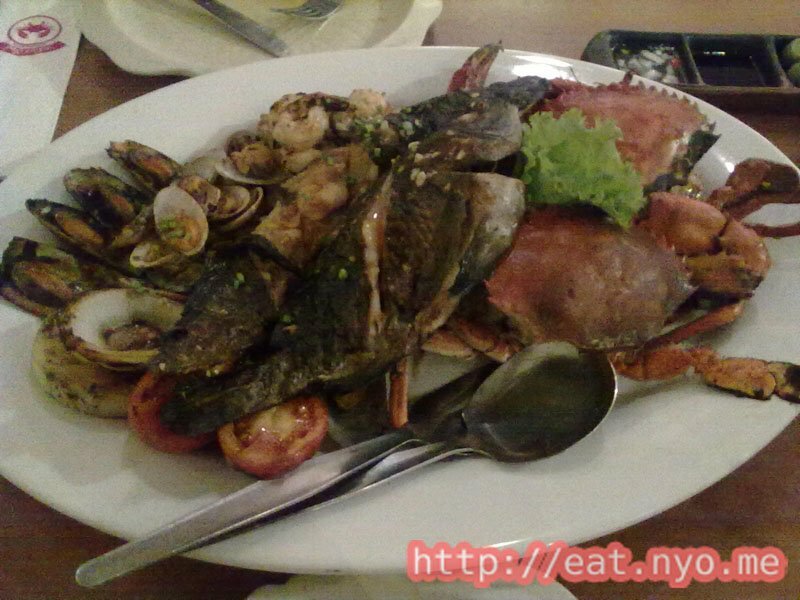 As for our main course, we got their King Seafood Platter (995 Php) which was apparently good for 2-3 people. They also have a slightly cheaper Queen-sized platter, but the waiter said it didn’t have any crab in it. We also ordered garlic rice, but that’s just so we don’t tire of too much seafood. Disappointingly, the Crab Relleno Salad didn’t look as good as it did in the menu. The amount of stuffed crab, while delicious and certainly packed with crab meat, were a measly two pieces. 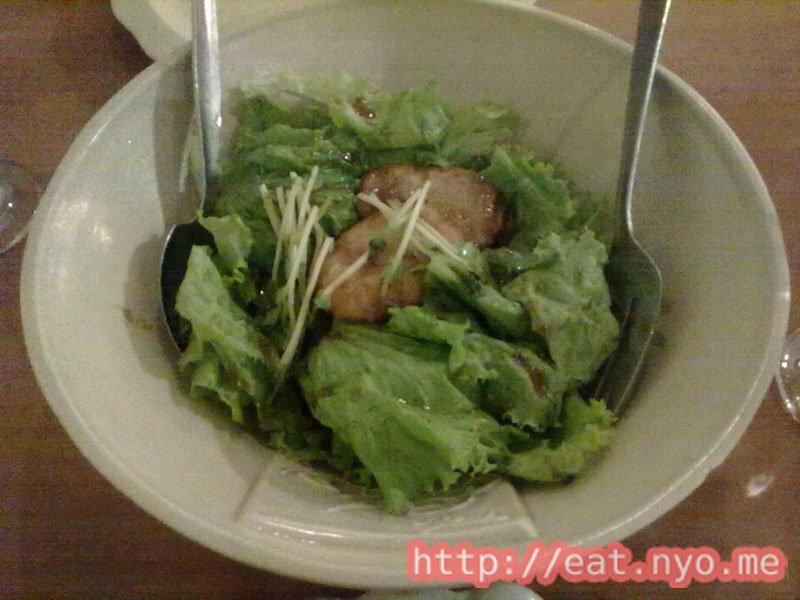 Admittedly, the salad was good—it had a generous amount of greens and sprouts in a mild sweet-and-sour vinaigrette. However, for the price, I expected more, more crab that is. While the first dish was dismal, the King Seafood Platter more than made up for it. True, the crabs they used were the smaller kinds, but there were two of them and had enough meat to keep me happy. There’s also a plethora of non-crustacean sea-dwellers, mostly grilled. There were mussels and clams, shrimps, a decently-sized tilapia, tuna belly, and an pretty large catfish. To say that this is good for two is underestimating the amount—this can easily feed three, perhaps four. And since I’m both a seafood and grilled food lover, all of them made my palate quite happy. We could’ve skipped the salad, perhaps ordered a different starter, and made the night perfect. After getting our hands dirty with the delicious platter, we were pretty pleased with our dinner. True, we could’ve had a buffet for two plus drinks with the amount we paid, plus ten percent service charge. I still thought it was a good value since we essentially filled ourselves up with a fine selection of seafood. Backed by the live ear-pleasing piano and violin duet, the place in itself is fine dining, indeed—except for the getting-your-hands-dirty part which shouldn’t be avoided if you truly want to enjoy the place. If you like seafood and have some cash to spare,** The Seafood Club by Red Crab** is a good place for a date. Not recommended for: Seafood haters. Smart nomnomnom tip: Using your bare hands and fingers is required for maximal crab-eating satisfaction.